Consumption of foods that are rich in fibre may help in keeping constipation at bay. One such delight that is not only appealing to the taste buds but would also keep a check on your digestion is mung bean and spinach soup. Do you happen to suffer from constipation problem? Is indigestion bothering you every now and then? If yes, then it is time for you to bring some tweaks in your diet. Our dietary habits play a vital role in enhancing or degrading our digestive health. Consumption of foods that are rich in fibre may help in keeping constipation at bay. 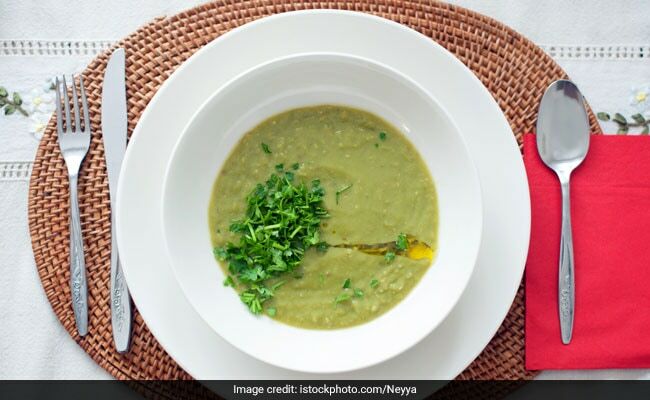 One such delight that is not only appealing to the taste buds but would also keep a check on your digestion is mung bean and spinach soup. According to the book 'Healing Foods' by DK Publishing House, "Mung beans contain a lot of fibre and potassium, both of which help lower blood pressure. They also have detoxifying properties and are anti-inflammatory, as is iron-rich spinach." To begin with, soak the beans overnight or sprout them for 3 days before cooking. Add little water to a saucepan and heat it over medium flame. Simmer for a while and then reduce the heat. Add shallots, ginger, garlic, turmeric powder, and coriander seeds to it and cook over low flame, stirring occasionally. Meanwhile, drain and rinse the beans. Now, add a dash of water, olive oil and beans to the pan along with some vegetable stock and increase the flame. Add salt and pepper to taste and serve this delight as a soup. Garnish with lime and cilantro leaves. So, bring together all the ingredients and make this healthy soup for yourself.